AAMI bill looks like ad, according to one popular video blogger. A woman was sent what looks 'exactly like a bill'. Except it's not. A video blogger and YouTube star has publicly criticised car insurer AAMI after she received a letter she says she almost mistook as a bill, rather than advertising material. 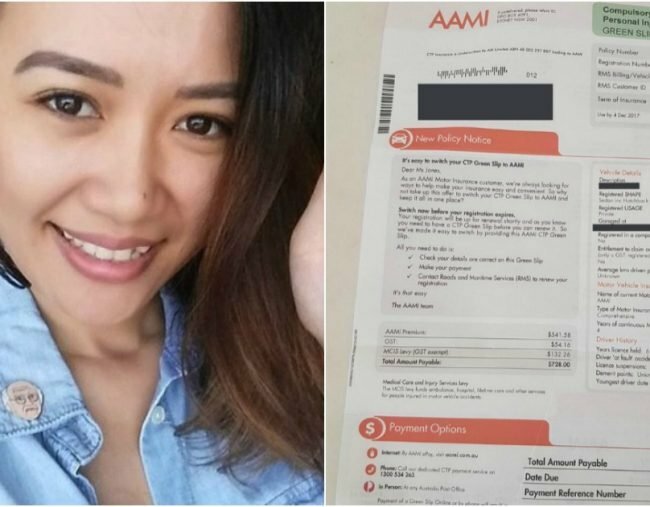 On Monday, Natalie Tran posted a photo of a letter she received from AAMI on Twitter, which was an offer to switch a CTP Green Slip to AAMI. However, Ms Tran says she almost paid the bill, as it appeared the offer had a due date and policy number. Writing alongside the photo, Ms Tran called the offer a “poor and disgusting practice”. “How is this legal? People must be unknowingly paying bills that are ads. There’s a due date and everything. F*** this,” the actress wrote. In a statement to Mamamia, a spokesperson for AAMI refuted the video blogger’s use of the word “ad”, arguing the letter is “an actual policy document” that is only ever sent to existing customers. In Tran’s case, the letter fell in her lap because her partner has a car insured with AAMI. “The whole point of [sending the CTP Green Slip] is not to mislead people, but to make their lives easier,” the spokesperson explained to Mamamia. “It does say clearly that it’s an offer to switch. “We have been doing this for years and we have no record of anyone ever paying this by mistake, nor have we ever had any complaints. The spokesperson argued after frequently being contacted by customers who want both their green slip and insurance under the same provider, the company intended to make life easier for customers by initiating the offer first. AAMI also told Mamamia the practice is legal, and “common practice” among other insurance companies. “The NSW Government CTP regulator, SIRA, establishes guidelines for the design of CTP certificates so they can be used as valid Green Slips. In the wake of the viral storm that came from her single tweet, Tran apologised for the “negative publicity”, saying she knows “other providers do it too” but that she finds the industry-wide practice “purposefully misleading”. AAMI said they had “no intention to be deceptive”, adding they “will listen to the feedback” that has come from Tran’s tweets.